The Way of Shadows is a big fat novel and I mean that in all good connotations of those terms. The world Weeks depicts in this novel is harsh: the protagonist is a killer-for-hire as is his mentor, his best friend is a male prostitute who serves both men and women, one Durzo’s closest companions, the enigmatic Momma K., is the head of a brothel, and ways of killing are spoken of very matter-of-factly. 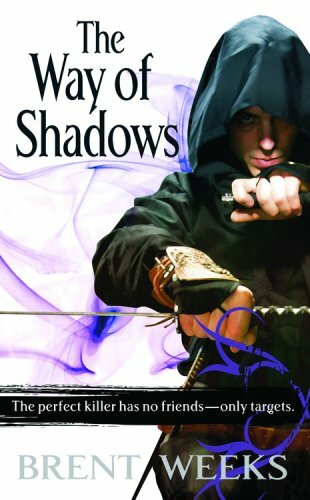 In addition, The Way of Shadow contains many of the elements of a solid fantasy novel: magic, murder, an über-powerful enemy pulling the strings, a nigh-omnipotent enchanted sword, and a chivalrous knight. By no means; however, is this simply a paint-by-numbers novel. In many ways, I would liken Weeks’s approach to some of the new fantasy authors who are embracing these standard elements of the genre and spinning them out with an entertaining voice of their own. Entertaining. Rich plot. Harsh but not wantonly so. Fast paced style.